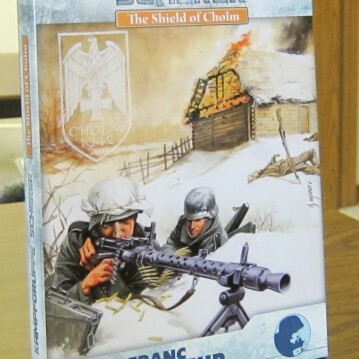 LFT’s second historical module, Kampfgruppe Scherer: The Shield of Cholm (KGS), comes courtesy of the person who designed their first, Andrew Hershey. This time, the action is an East Front action, detailing fighting for and around the Soviet village of Cholm (spelled Cholm by Germans, Kholm in Russian transliteration; both spellings are used in the module, oddly, but Cholm will be used here because that spelling is utilized most often in, and for the title of, the module). This somewhat strategic village in north Russia was occupied by the Germans, but surrounded by the Soviets during their 1941-42 winter counteroffensive. However, supplied by air, the 4,500 Germans in the town held out despite numerous Soviet attempts to take the town, and were finally rescued by a relief force in May 1942. As its title suggests, the module has a very Germanocentric perspective. The most striking thing about KGS is its components. In terms of sheer physical quality and presentation, KGS may be the most impressive ASL product released, official or unofficial. There just doesn’t seem to be any cutting of corners or compromising in the components. Everything is full color, everything is bright and attractive, everything is well done. This is a very expensive module (especially for Americans, who bear the brunt of overseas shipping and a poor exchange rate as well), but at least the purchaser will clearly get something for his money. Component-wise, KGS sets some new standards for ASL products. Let’s take them in turn. The 36-page rulebook is printed in full color on glossy paper. There are not, however, 36-pages of rules that players have to learn. The booklet includes designers notes, lots of designer endnotes, and various maps and bric-a-brac. There are about 21 pages of actual rules, and most of these are for the Campaign Games. To play the scenarios, comparatively little rules reading is required. 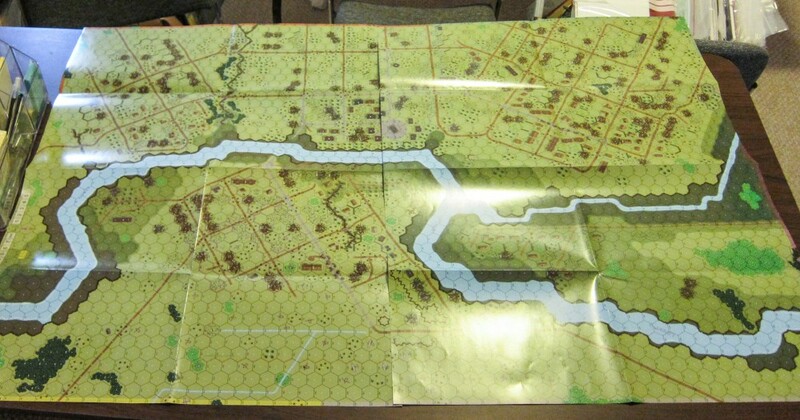 Some of the rules explain the map terrain (see below) to the reader; there are also rules for dividing the town of Cholm into seven Sectors, each of which is further divided into “blocks” or units (48 total). These are used for victory conditions and for several things in Campaign games. Given the open nature of the terrain in KGS, these are not like the blocks in A Bridge Too Far, nor is the terrain anything like that of any of the other urban HASLs. Rules also introduce a new type of entrenchment, the “Snow Sangar.” If an ASLer ever wanted to build a snow fort, here is his chance. Other terrain rules detail specific terrain issues on the map, such as a bridge with a barricade on it, debris, irrigation ditches, printed truck wrecks, orchard-graveyards (and other combinations hexes), the airstrip, aircraft wrecks, the prison, izbas, wooden-stone buildings, gutted buildings, a sniper zone, and a wall-less barn. Unfortunately, some of these terrain rules make references to rules in other HASLs. 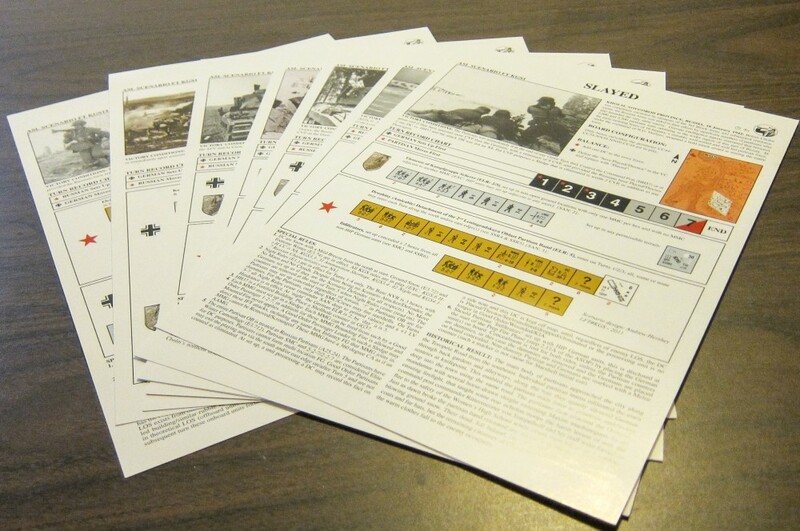 Consequently, it appears that players must have the rules pages for Red Barricades, Pegasus Bridge, and Valor of the Guards, in order to play KGS. The campaign games require extensive use of Red Barricades rules. 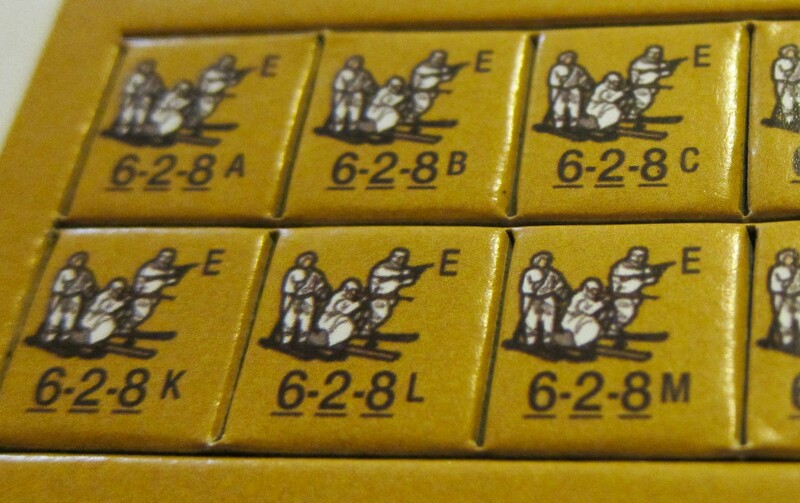 Further rules provide German-specific rules (grenade bundles, OBA particulars, ammo shortage, and more. There are extensive rules (5 paragraphs worth) to allow German MMC to “convert” HMG into MMG, though the only immediately obvious reason why someone would ever want to do so is to be able to rout with it. 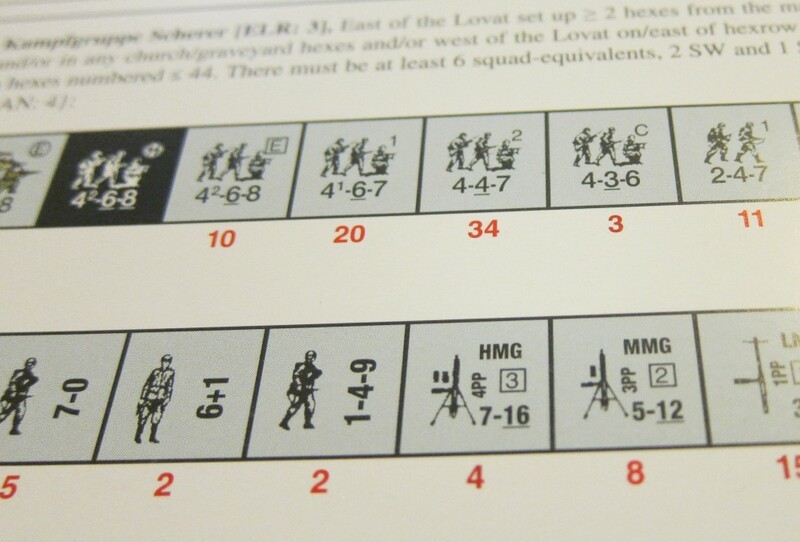 Soviet specific rules include ski troops and SMG companies, routing off map, block bombardments, and an interesting concept in which an MMC may possibly be “promoted” through a “successful” Human Wave attack. Campaign game rules include “Alarmeinheiten” (alarm units), which are provisions for allowing the Germans to hide various types of military assets (units, SW, Guns, Sledges, Wagons, and Horses) off map, rendering them immune from bombardment. However, if they do so, they do not have full control over the release of these units/items. Other rules provide for Walking Wounded, Air Support, Snow drifts, purchaseable Weather Reports (WeatherBug did not exist back then), the landing (or crashing) of Gliders and JU-52 transports, air-dropped supplies, ammo dumps, and German supply lines, among others. Four maps come with KGS; this might seem like a huge playing area, but actually the maps consist of two sets of two maps. One map set is used for situations early in the fighting, in the winter, when the town was also fairly structurally whole. The other map set depicts the exact same terrain area, but three months later, in the spring, when the snow and ice were melted and gone. Also, by then the town was little more than a smoldering collection of ruins and debris and this too is represented on the second set of maps. Providing two sets of maps is an imaginative concept. Though some designers have previously considered the notion, this is the first time it has been put into practice. The maps are printed on glossy paper on fairly thin stock and have lots of map folds (each map basically is folded into eight sections). 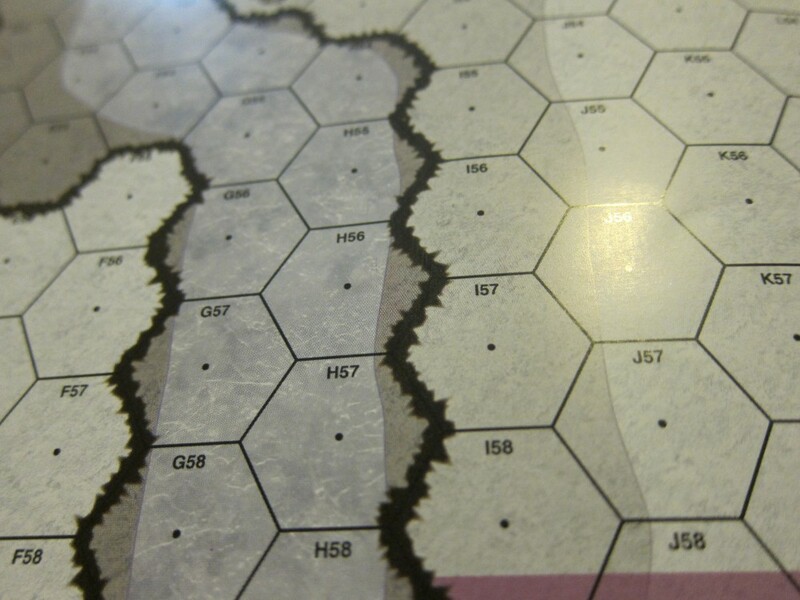 This combination means that the maps will wear fairly quickly being folded and unfolded, especially the “folding focal points” around hex L14/L43 (which were already showing signs of wear when the copy used for review was first opened). Players will need to protect these maps. Three of the four maps in the copy used for review contained irritating wrinkles on the map (see pictures below). The artwork on the maps is computer generated and generally looks nice. The woods are somewhat balloony, while the orchards are accompanied by long shadows, giving them a rather out-of-focus look. Many of the buildings have a computer generated look, while the cemeteries have little squares of wall texture that are apparently attempts to represent gravestones. Some of the block outlines are a bit too faint. On the other hand, there are a number of nice touches. The “Pole Barn” has seen some war damage, while out in front of it are the burnt-out remnants of a truck convoy that ran into some bad luck. Many of the landed gliders even has scrape marks trailing out on the ground behind them. Various place names are marked, such as the Girls High School and the evocative “Villa of Last Hope.” The bridge piers for a destroyed bridge stick forlornly out of the water. Overall, they are maps that players are likely to want to play on. 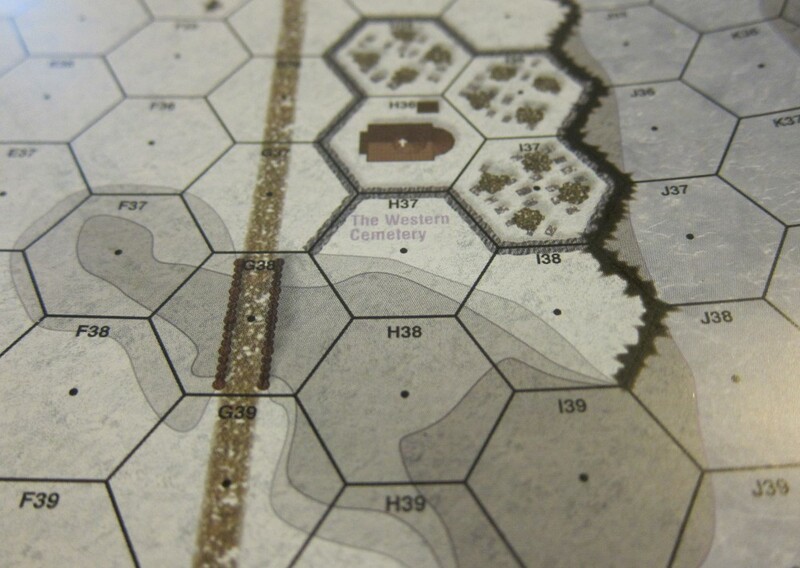 The “winter” version of the maps are perhaps the most interesting, because they represent the first serious attempt to portray winter conditions on a map (there was a rather poor attempt in one of the mini-maps in Heat of Battle’s FireFights!). Overall, KGS does a good job in this respect. The open ground hexes are not a pure white, but are rather textured, so that they don’t have the artificial feel that a pure-white hexgrid would create (the “spring map” open ground hexes are not textured, but pure green). The roads are flecked with snow, as are the hedges and woods (but, oddly, not walls or buildings). The river is nicely icy. Overall, the “winter” maps look very nice. There is also a large (page-sized) winter overlay used to replace a section of the “winter” map in order to provide a different degree of destruction for some scenarios. 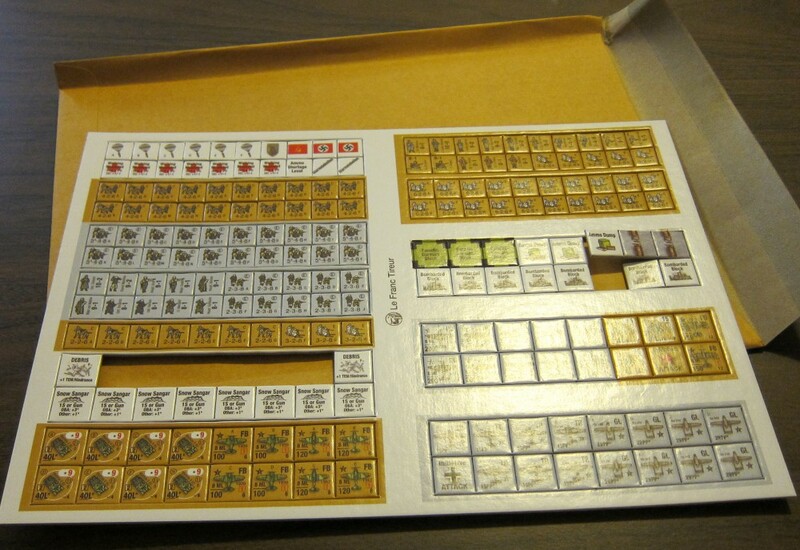 KGS comes with one countersheet containing a mix of 1/2″ and 5/8″ counters (210 in total). The KGS countersheet has the same problem that previous LFT countersheets have had in that the die-cutting is too deep and frequently cuts through nibs, so that the counters immediately start falling off the counter tree (this is why the countersheet comes in its own envelope; otherwise many of the counters would come loose before the game was even opened). Consequently, players need to be very careful when handling this countersheet before punching it out and storing the counters; otherwise, there is a very real chance to lose some counters. The counters themselves are very well done and attractive. Somewhat over 50 of them represent German 5-4-8s and Soviet conscripts in winter camouflage. This is a nice touch and it is surprising no one ever thought of it before. The German 5-4-8s represent assault engineers, but it is not clear why winter camouflage conscript troops are provided (since lots of Soviet troops had winter camo, not just conscripts). There are also Soviet 6-2-8s/3-2-8s that are winter camouflaged ski troops. Various leader and hero counters are also provided. There are some Matilda IIs in Soviet colors, some German and Soviet dive bombers and fighter bombers, and counters for JU-52s and Gliders. 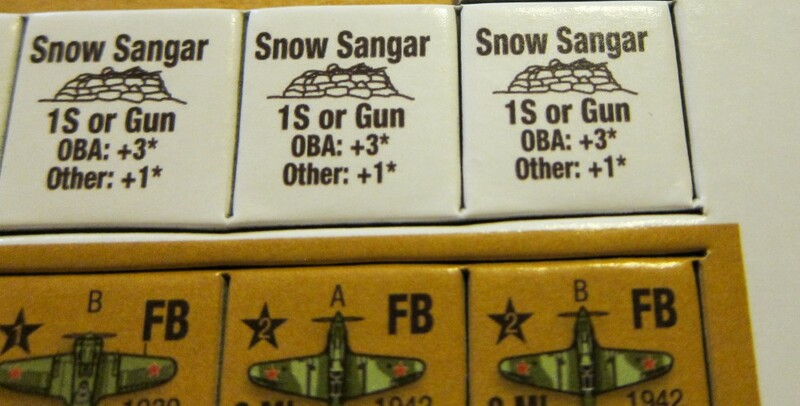 There are also some debris counters (with a white winter side and a brown side), Snow Sangar counters, air drop counters, walking wounded counters, counters for Fanatic German Blocks and Bombarded Blocks, and various other markers. 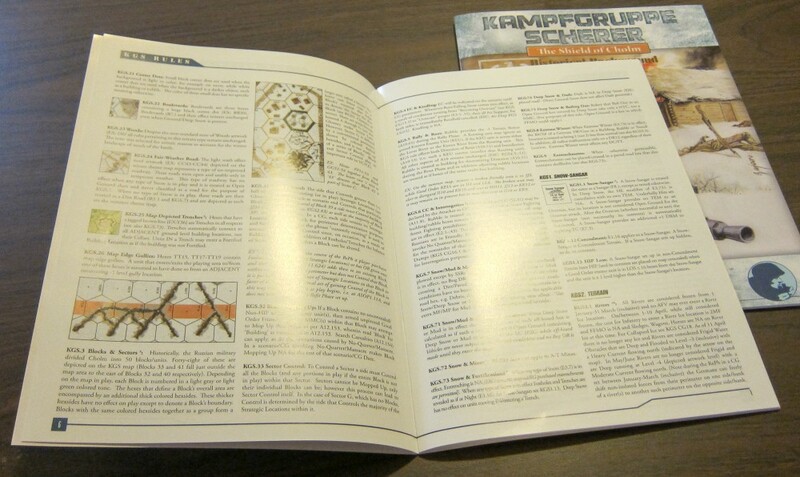 KGS also comes with a huge, 52-page full-color historical booklet with sections written by designer Andrew Hershey and by amateur historians Jason Mark and Dirk Burgdorf, both of whom have written or are writing books on the subject. 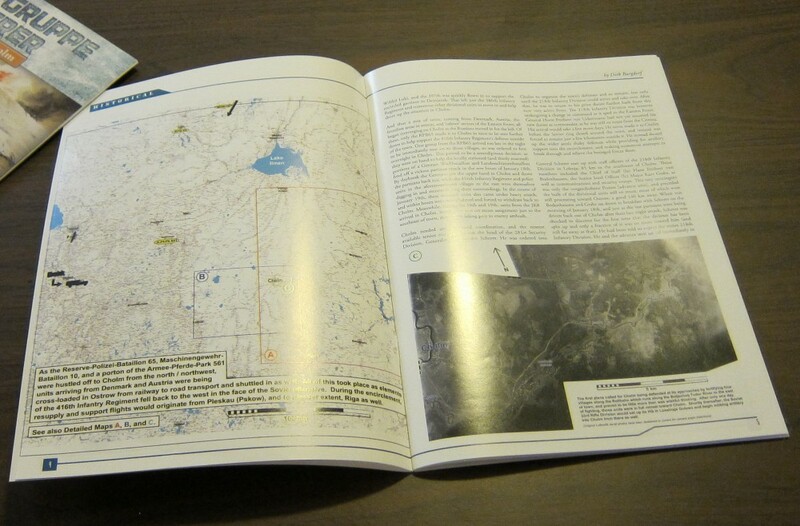 The sections include a general overall view of the campaign, a more in-depth look at the fighting in early May, a German order of battle and “biographies” section, a Soviet order of battle, and a “then and now” section (inspired by After the Battle magazine, perhaps), comparing/contrasting historical photographs of the terrain fought over with modern photographs of what it looks like today. 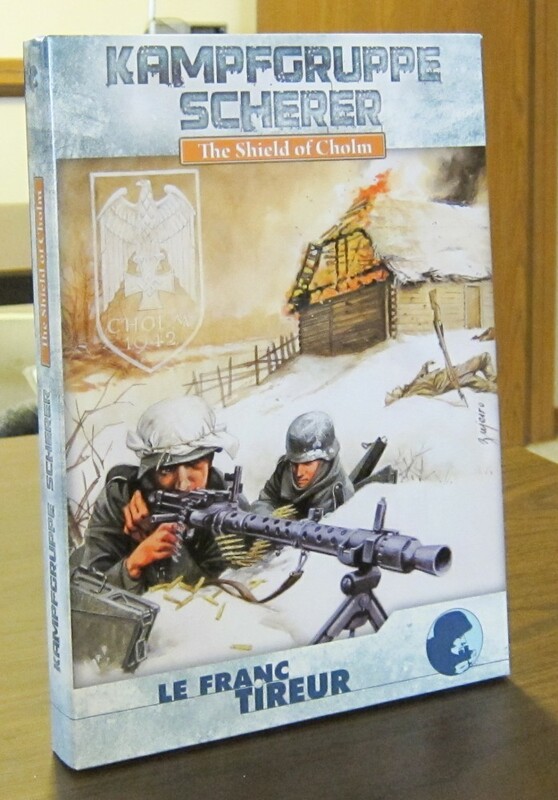 There’s a lot of (Germanocentric) detail in this booklet, and while East Front history buffs will probably already be familiar with at least the outlines of Cholm, those who aren’t can learn all they want to (and possibly more) about the battles there. The best article is the overview written by Dirk Burgdorf (all the more interesting, considering English is not his first language). The Jason Mark article is inferior. In any case, the booklet is okay, but rather of a luxury and its inclusion certainly increased the price of the product. A smaller and more modest booklet would still have been useful to gamers seeking historical background, but would not have added so much to the overall cost. 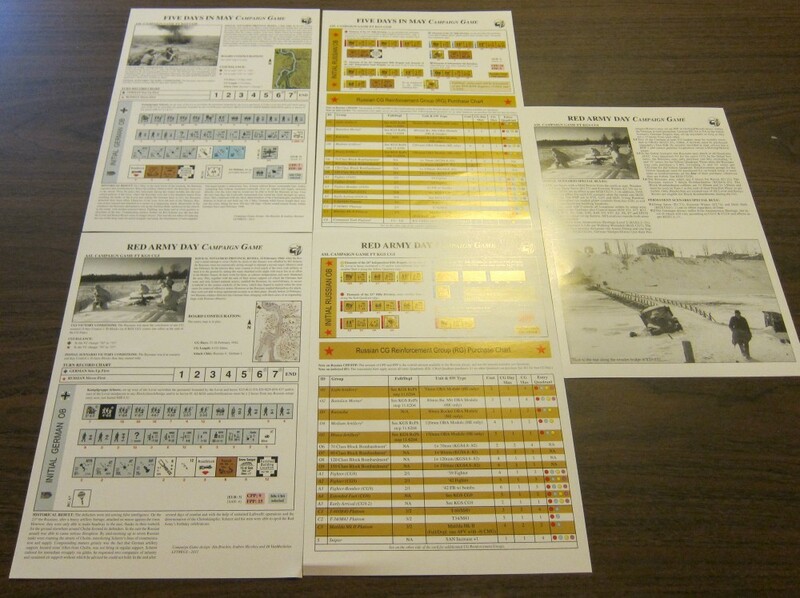 KGS provides both the Soviet and the German player a “quick reference card” that summarize and/or provide rules references for key rules that may apply to them. These are a nice touch and other HASL designers should pay attention. There is also an enlarged image of the GPU Prison and vicinity (stacks must get thick there), printed on the back of one of the scenario cards. So what can you use all this stuff for? 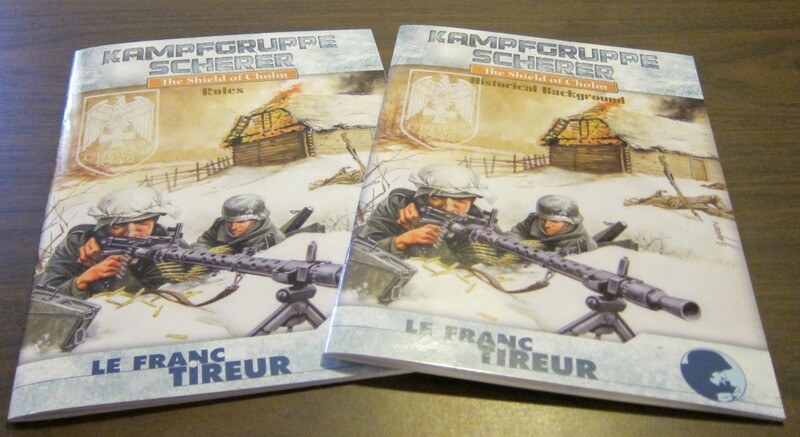 KGS provides 15 scenarios and 2 Campaign Games (which use modified Red Barricades CG rules). 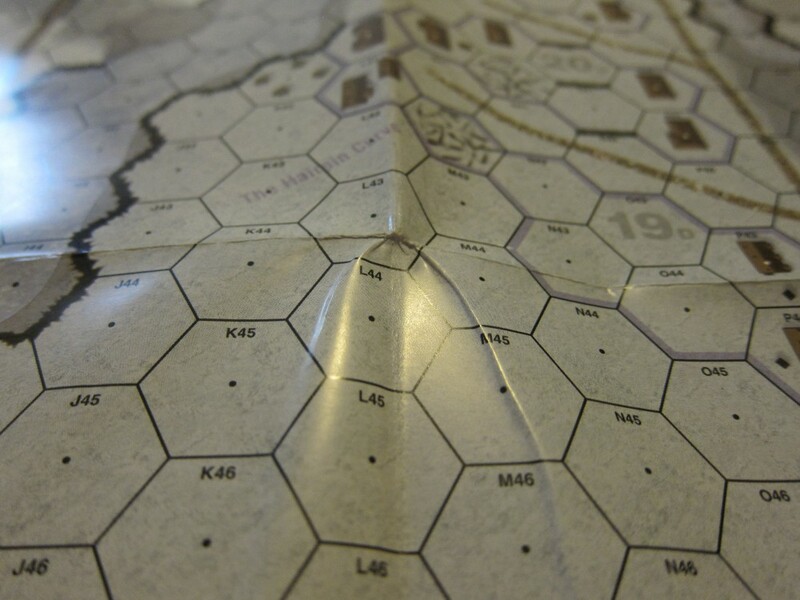 Scenarios are set all over the map, but many of them use only a very small playing area. Eight of the scenarios use the “winter” maps and seven scenarios use the “spring” maps. Of the 15 scenarios, 7 are large or very large, while the remainder are medium or small in size (mostly the latter). This is essentially an “advanced” module, not only are there numerous KGS rules to consider, and (for the winter scenarios) numerous weather rules to keep in mind, but many of the scenarios use rules sections that beginners may not yet be familiar with. Slightly more than half of the scenarios have OBA, while a third of them utilize Air Support (and some have Air Drops). Three of the scenarios use the Night rules. However, as a product, it is considerably more accessible than the previously-released St. Nazaire. Several of the scenarios look interesting for various reasons. One is KGS2 (Their Fate Sealed? 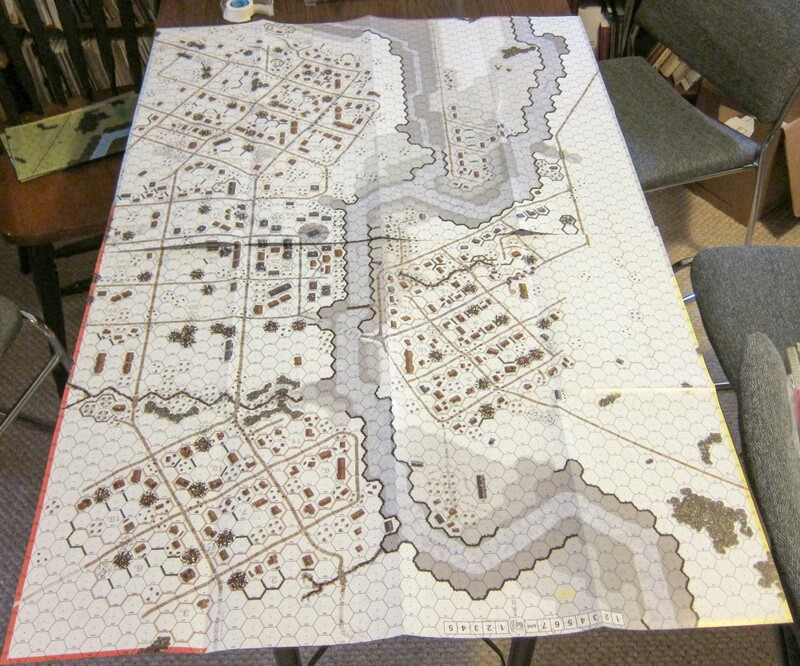 ), a monster 12-turn “winter” scenario that uses the entire map. It depicts a major Soviet assault on Cholm shortly following its encirclement. This is a massive scenario that will require more than one counterset to play (possibly Beyond Valor plus Red Barricades, already needed for the rules, might be sufficient). The Soviets start with 49 squads (of various types), 10 leaders, 20 SW, and 6 AFVs, then are reinforced by 83 more squads (! ), 13 leaders, and 34 SW. They also get a passel of artillery. The Germans get some fortifications and have 86 squads, 20 leaders, 2 heroes, 2 guns, and 47 SW (Extreme Winter is in effect, so many of these may not last). Interestingly, the Soviet reinforcements can enter in Human Waves. 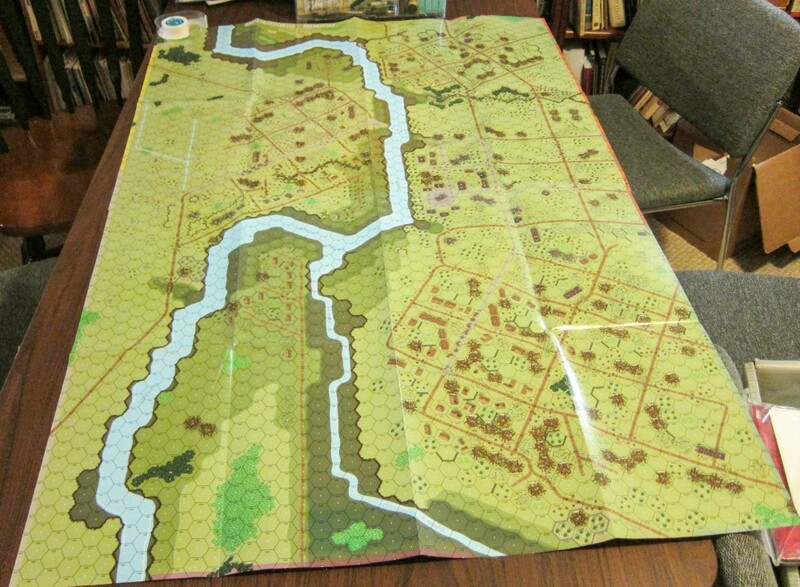 The nice thing about this scenario is that it is large enough to require multiple playing sessions, so it can act as a substitute campaign game, without one having to absorb all the CG rules. Moreover, it is relatively simple in terms of its SSRs, etc., so it is a very accessible huge scenario. 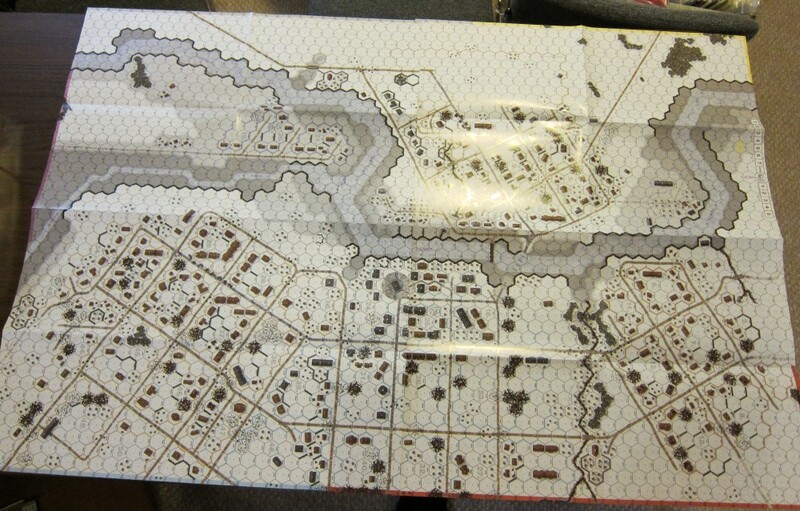 KGS3 (Reclamation) is another interesting scenario, a largish action depicting a German counterattack across the frozen Lovat river to try to clear the western section of town. 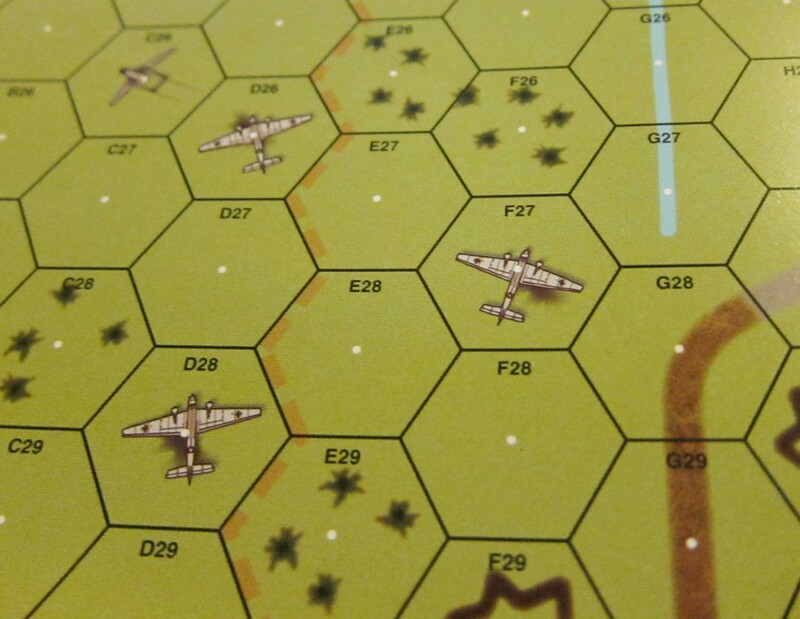 KGS5 (Red Army Day) features a Soviet attack in the southeastern quadrant of the playing area, supported by Matildas. The oh-so-Freudianly titled KGS8 (The Battle in the Tunnel and Organ Gully) is unusual in that it is inspired by an action depicted in a sketch drawing by a participant of the battle. It is probably also the smallest and most quickly played scenario in the module. Two more scenarios, KGS12 (May Day – East Side) and KGS13 (May Day – West Side) representing two portions of a massive Soviet attack on Cholm launched on May 1, 1942. “East Side” is a massive scenario utilizing the entire eastern half of the playing area, while “West Side” is its kid brother, smaller in size and utilizing the northwest quadrant. Lastly, KGS15 (Fighting Over the Dead), taking place in June 1942, weeks after reinforcements had reached Cholm, is a Night scenario that depicts a Soviet attack on the Northern Graveyard. What is interesting about this scenario is that it basically comes in three versions. Players can play it as a single scenario or as a “best of three” match by utilizing each version. 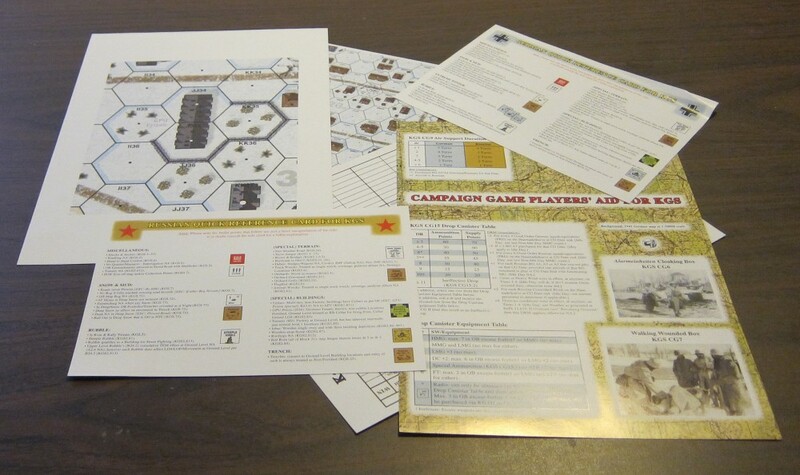 Prior to setup, the Soviet player may pick one of three options, which determine victory conditions, game length, and the method by which the Soviets enter. 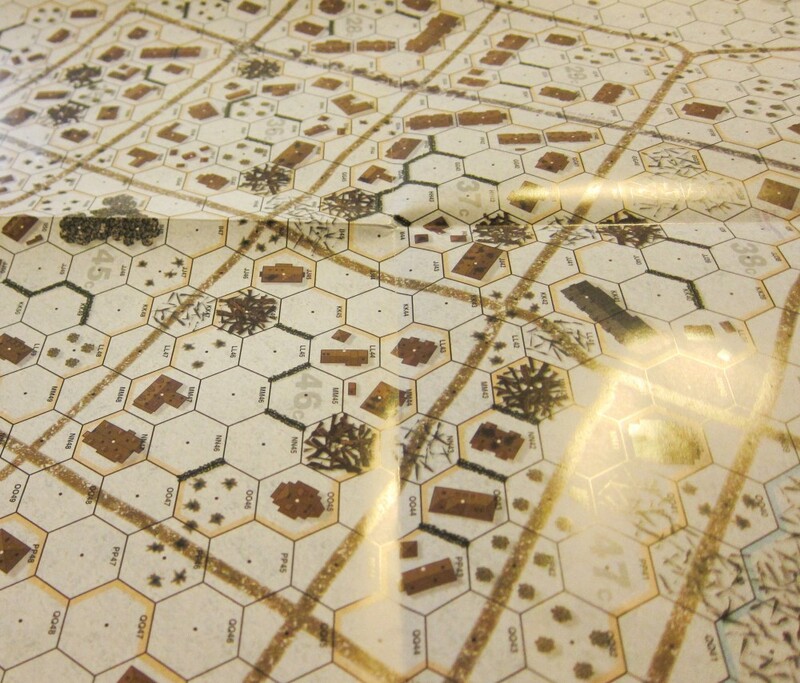 For example, Option 1 is 4 turns long and, to win it, the Soviets must control 4 hexes. However, all the Soviet units have to enter on Turn 1 as a single Human Wave attack. Option 2 is 5 turns long; in it, the Soviets must control one specific hex (of the 4 in Option 1) and any two of the remainder. In this option, though, the Soviets must divide their forces into two Human Waves, one of which enters on Turn 2. 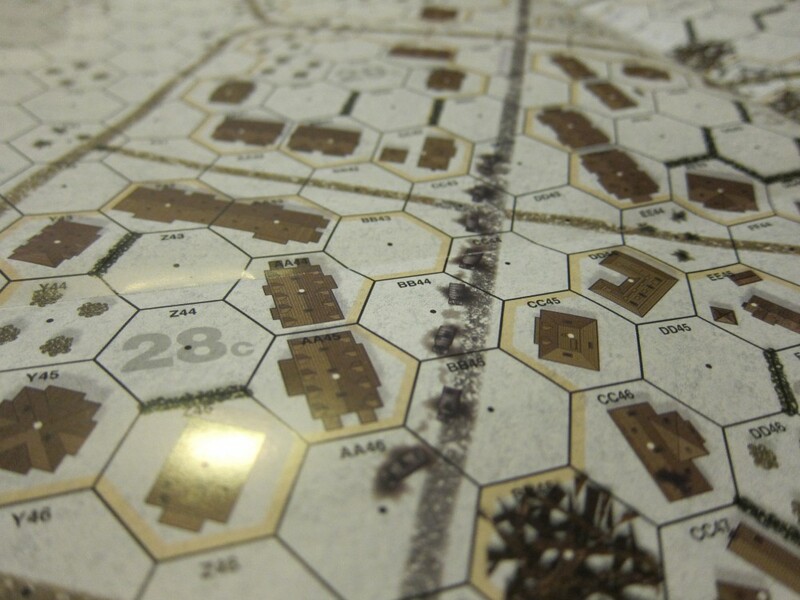 Option 3, at 6 turns, requires the Soviets to control any two of the 4 hexes. They enter as three human waves, one on each of the first three turns. As the scenario is relatively small, the “best of three” match actually is a feasible option. KGS also provides two campaign games. KGS CGI (Red Army Day) takes place in February 1942 (thus using the “winter” maps and is only 4 CG dates long, making it fairly manageable in size (though it still has a ton of units). The attacking Soviets must control 30 or more blocks of Cholm. KGSCGII (Five Days in May) takes place, as the title suggests, in May 1942, and represents the final Soviet attempt to take Cholm before the relief force could make its way into the town. This CG is also relatively short, at only 5 CG dates (but has a lot of units). It should be noted that in all of the scenarios and Campaign Games, the Germans are bereft of AFVs (in one CG, they may purchase a captured Soviet light tank). The Soviets tend to have minor armor support, but they never have a ton of armor. 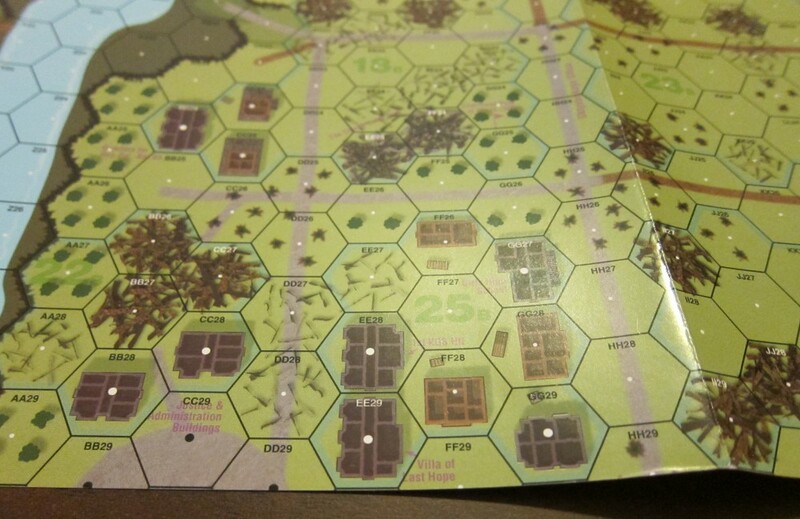 Consequently, this is very much an infantry game. Those ASLers who only like situations with tons of vehicles should be forewarned. They may have to make due with MG mounted on sledges. Them’s the breaks. So what’s the bottom line? Overall, KGS looks as if it is a very fine product. It certainly has tremendous production values and it looks like it can easily provide a lot of play value, too. Moreover, it represents a nice HASL situation that does not, as so many HASLs do, focus on dense urban terrain. It has a very different look and feel to it. It could easily be worth its not insubstantial price.